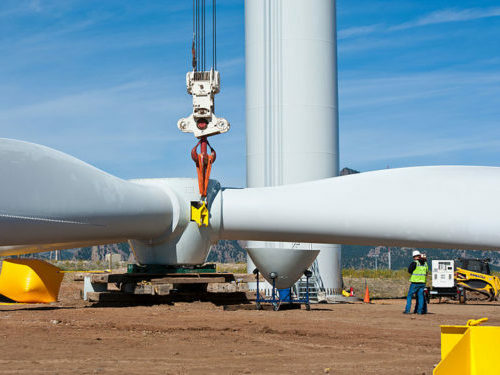 Falling technology costs and expanding markets will send global wind capacity soaring by 50% over the next five years, according to an annual report by the Global Wind Energy Council (GWEC). Total global wind capacity now stands at 591 gigawatts, with the addition of 51.3 GW in 2018. Now, GWEC is forecasting more than 300 GW of new capacity to be installed by 2023. The surge will be “driven by emerging markets in Africa, the Middle East, Latin America, and Southeast Asia, as well as the increasing competitiveness of offshore wind,” Reuters reports. Reflecting one factor in the industry’s growth, CNBC reports that installation of General Electric’s 12-megawatt wind turbine prototype is proceeding according to plan, after a ceremonial groundbreaking earlier this month in Maasvlakte, Rotterdam. The Haliade-X 12MW will stand 260 meters tall and have 107-metre-long blades, the U.S. TV network notes. While the mammoth turbine is intended for offshore wind farms, testing will take place on land. After investing US$400 million in development and deployment, “we are on schedule to install the biggest and more powerful wind turbine in the world,” said Vincent Schellings, GE’s engineering and product development general manager for offshore wind, adding that the new machine will “contribute to make offshore wind energy more competitive”.